Hauck Fun For Kids is recalling more than 26,000 go-karts because the steering wheel can detach, break or crack while in use, posing a laceration or collision hazard to young children. 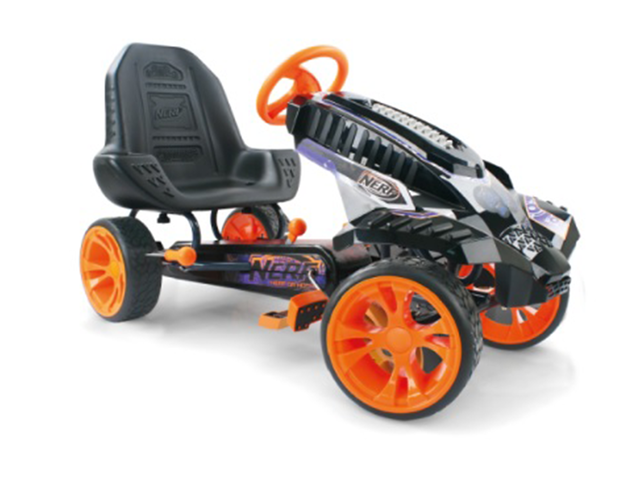 According to the U.S. Consumer Product Safety Commission , the recall involves the Nerf® Battle Racers, a four-wheel pedal-powered go-kart for children ages 4 to 10. Only go-karts with model number T91869 and a date of manufacture between January 2016 and March 2017 are being recalled. Both are printed on a white sticker located on the underside of the seat. The go-karts were sold between $200 and $300 at national retails including Orsheln Farm, Shopko, Target, Toys R Us, Wal-Mart and online at Amazon.com and Fingerhut.com. Hauck Fun For Kids has received 639 reports of the steering wheels breaking, detaching or cracking. One case resulted in a laceration to a child's face that required stitches. Consumers are urged to immediately stop using the recalled go-karts and contact Hauck for a new steering wheel. Hauck can be contacted at 877-428-2545 from 9 a.m. to 5 p.m. ET Monday through Friday or online at www.hauck-toys.com .